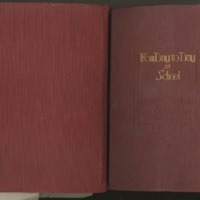 A scrapbook that includes clippings, ephemera, and photographs of Florence L. Anderson's time at Danbury Normal School. Anderson, Florence L. “Florence L. Anderson From Day to Day at School.” Florence Anderson Scrapbook. WCSU Archives, 10 Oct. 2018. Accessed on the Web: 18 Apr. 2019.